cool. I might have to get a weedless spoon. The canals where i spin seem to have thick weed all year. Does anyone actually lure fish in winter then? What are the catch rates like? I lure fish all year around. As with most other fishing, bites are not as frequent but the fish do feed and will continue to take lures. If your budget will allow, I suggest getting a buzz bait and use it at first light for a few casts and again near last light for a few casts. Most days it will produce nothing but you will find an occasional winter day when the fish are having it. Black is a great colour for those times and for fishing the lure at night. The Johnson Silver Minnnow is an excellent spoon for snaggy & weedy areas as it basically does not get hung. 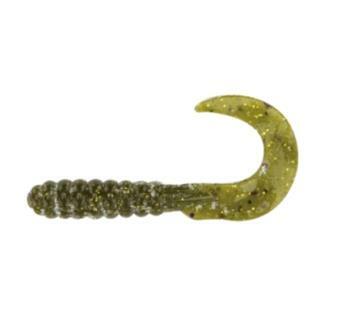 Adding a soft plastic grub on the hook so it trails behind can increase your success. Something like one of these (and I know the tacklebargins web site you can find advertising on here sells them). When the Newts came over to the U.K. I had the great honour to accomodate them for one night. Much appreciated was a life times supply of bass stuff, most being Texas riggable. And so I have tried and had success. However I feel happier with an exposed hook, even whilst tripping the bottom. A number of the hooks that Newt presented me with are very similar to what I would call a circle hook and these I fish flying free from about two thirds down a worms body. Even when lobbed into reeds and undergrowth I find snagging rare. All I can say is that it works and works well when other stuff seems to be ignored. Fished on a light baitcasting outfit it really is a pleasent way of catching. Went out today with afew spinners and lures. Fished up the canal at stretches that are reported to hold good pike numbers. Its still very weedy and shallow on the canal so mostly used a floating white/red head Shakespeare big S. Covered alot of ground and water, and had absolutely nothing. Two blokes who were also fishing gave up and went home after blanking. Ive been out bout 4 or 5 times recently and blanked. Cant find the fish at all in these colder days. Apparently a lad made a killing on deadbaits in the very same spot I was fishing. Took 5 fish and a good double. So frustrating. Apparently he was fishing first thing in the morning though, and another fisherman reckoned he will have spooked the swim for the day. A bloke reported a number of pike hearding and chasing baitfish at the surface. SO this guy was either lucky or the feeding times in winter are short and furious. i used to be a big lurest and i still am but i have found that wobbling have been outscoring lures for me on every water i try, small roach from baits direct with no weight works best for me. I was at Chew last week and had action straight away in the morning when it was still foggy and cold but the bites & fish really dried up as the sun came through. The activity did pick up again later on in the day and this was evident by all the fry scattering on the surface but the morning definately was the best time. Edited by Neil G, 19 November 2007 - 08:30 AM. Ive had a few fish during the recent cold spell on a new lure Ive been trying.Its the Storm Kickin Minnow.I picked a couple up whilst in the US visiting Newt in both 6" amd 10".Got the 10" really for on the Trout reservoirs but the 6" has been doing the buisness on the Thames! Interests:Allrounder but specialising in big perch. Managing my gravel pits at Wingham, Kent. Were you able to try deeper water when the sun broke through? It doesn't always work but is well worth a go. It may be because the fry go deeper chasing plankton that in turn are light sensitive. Or it may be that the pike have a greater success rate in poorer light. Having said that, I find mornings this time of year to be good on many waters. Each one is different though, and sometimes for a season or so they completely change! I also find dusk often throws up a pike even when the afternoon has been dead. Anyone been out with the lures recently? In general once the cold has set in I tend to bait fish on most of my day trips.However if Ive only got limited time or its a spur of the minute type trip I often tend to wobble or lure fish. Was doing quite well on lures (had my first Thames 20) during the first high pressure spell we had a few weeks back but since then its gone a bit pants and the bait rods have been out. Today we had a bit of a break in the weather that I had not anticipated so took advantage of it.Bit low on baits so grabbed the lure rod.Been using a swim bait (6" Storm Kickin minnow) that I brought in the States recently quite a lot and having caught well on it have been showing it around to a lot of people.As a result of this and the snatched nature of the trip when I reached into the bucket to pull one out and stick it on neither were in there!!! In a way it was good though as Ive been a bit blinkered with it since getting back to the UK.So instead a Super Sandra was stuck on and flicked out in to the current. A few retrieves and a few fish later I remembered what a great lure these are! Used to use the big ones all the time on the trout res's before the Bull Dawgs became the must use bait. After today Ive started to think what is it that makes a Dog better than a Sandra? certainly aint the price!! or their fish catching ability! Best fish today wasnt massive (12lb ish) but the dozen or so other fish between 4 and 10 made it a pleasant half day.Best of all it re light my love affair with an old lure that had been put out to pasture! Edited by BUDGIE, 03 December 2007 - 08:23 PM.